I always end up with lots of apples and bananas after navrathri, i m sure it must be the case with many who keep golu. Bananas atleast i freeze them to be used later in smoothies. But with apples i don't know what to do? How much can we eat, and how much can we cook? This time, i just shredded all the apples around a dozen of them and made into a jam, nothing fancy, just a normal homemade jam, with lots of spices. It tasted a bit like halwa too, this way you get to satiate your sweet tooth too. Okies i still have some leftover apple jam, so decided to make them into muffins for the bake-a-thon. These muffins are not the fluffy kind, these were a little bit dense, but a nicer dense, not the cardboard-y dense. Every bite bursting with the flavors of the apple jam and the warm spices added to it. To top it more, i inserted a caramel fudge candy into each muffins to get that warm gooey caramel when you enjoy the muffins warm. 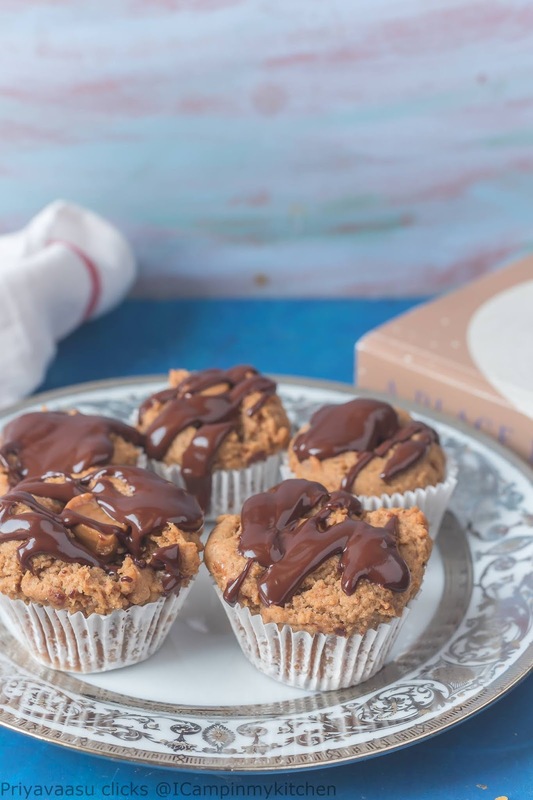 These are perfect breakfast muffins, if you chuck the caramel, since i made these for kids, i thought why not? 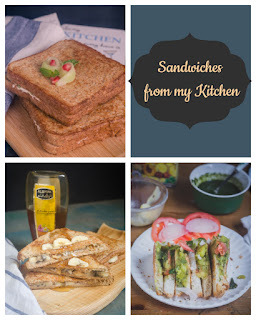 Make these for a quick evening snack to surprise your lil kings/queens at home. Wash, peel, core and shred the apples. In a sauce pan, add butter, next add the shredded apples, saute it. Next add the spices and sugar and mix well. Let this cook in slow flame, until all the liquid is absorbed. Once done, cool it completely and use it in the cake. If not using immediately, store it in an air-tight container in the fridge. This can be used as a spread on breads/roti's, tastes delicious. Preheat the oven to 170 C and line the muffin tray with liners. I got around 8 medium-sized muffins for the above measurement. Sift together flour, baking soda and baking powder. Since i have added all spices to the apples, i didn't add any spices to the flour mix. In another bowl, take the apple jam, add oil and buttermilk to it and whisk well to a smooth liquid, it won't be runny, but a smooth wet substance. To this add the flour in batches and using a spatuala mix the contents to smooth batter. Take care not to mix vigorously and mix in single direction and see to that no white flour is left in the batter. The batter would be thick, so you have to spoon the batter into the moulds. If you feel it is very thick, add 2-3 tbsp of water/milk/buttermilk to it and mix again. Using an ice-cream scoop, scoop the batter into the prepared muffin holes. Fill 3/4 of each hole. Stick a caramel fudge candy in the middle of the muffins. I left a little of the candy to peep out of the muffin. Bake the muffins in the preheated oven for about 40-45 minutes or until a skewer inserted in middle comes out clean, in this case you might get some gooey caramel!! Remove the muffins from the oven, let it cool on the wire rack, serve them warm. To enjoy the gooey caramel, the muffins must be served a little warm. If they are pretty cool, you might taste chewy caramel, in that case warm the muffins and serve. Both the kiddos wanted some chocolate on top so i drizzled a little ganache on top and served. 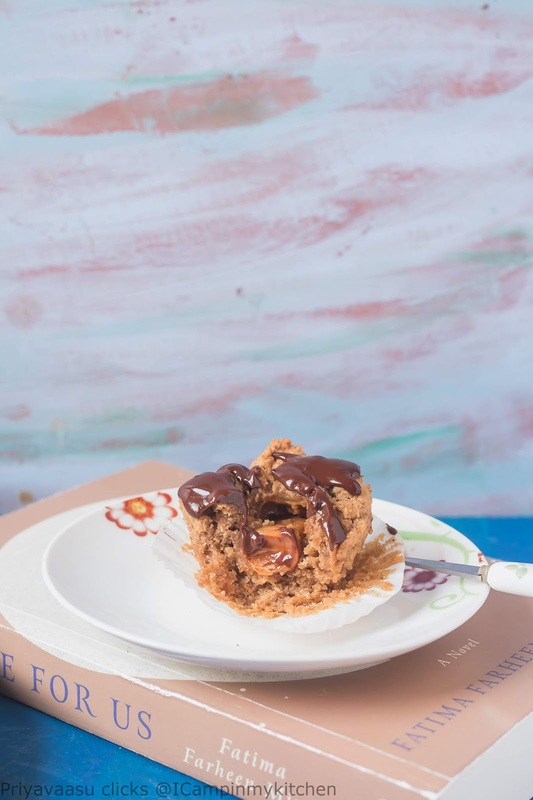 The muffin with the gooey caramel and chocolate ganache drizzle looks irresistible. My daughter would polish off the plate immediately. Such a prettiest and dangerously delicious muffins, absolutely am in love with your muffins. Apple jam muffins rocks. Next time you have excess apples , make juice ! Ha ha , will be healthy too . I can not deny that I like apples in any baked form , and these muffins have a burst of flavours . 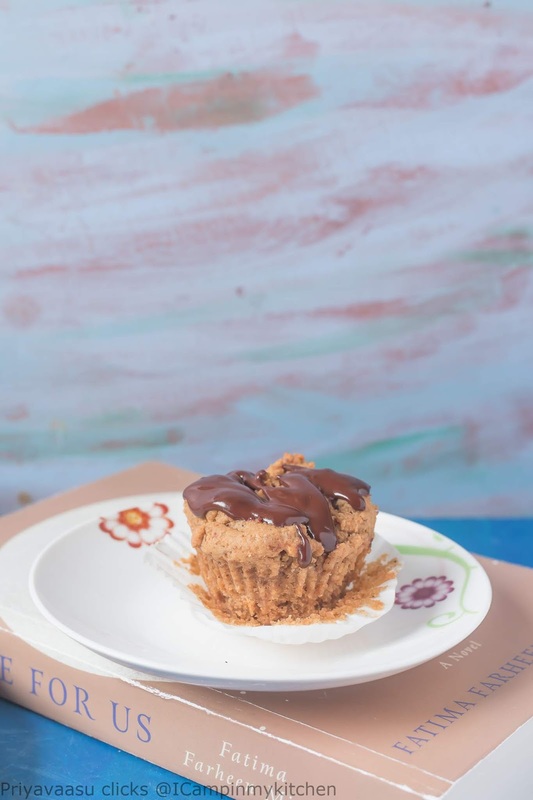 Such an interesting muffin,looks gorgeous.Esp.the chocolate gana che drizzle makes it even more prettier and delicious. Girl, I am going to be making this soon..though I have a basic apple jam recipe, your recipe sounds fantastic in a bake..the whole bake looks like heaven! What a delicious way to use up apples. I am not a big fan of apples and usually end up with quite a few once in while. 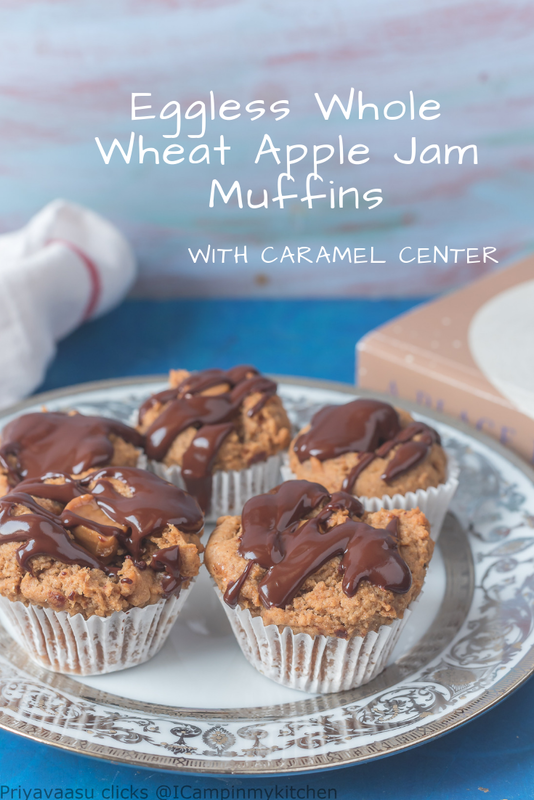 These muffins sound perfect with the apple jam. Will have to try some time. Loved this idea of caramel center and indeed with the chocolate toppings super yumm muffins!! Apple jam muffins looks absolutely delicious and tempting.Lovely bake and bookmarked it. Homemade apple jam in muffins.. very nice idea to use when are getting bored of eating apples. The muffins look so tempting with the chocolate drizzle!! OMG I am drooling hear just seeing at this pic. And you mentioned gooey caramel filling, wow match made in heaven for me. I am bookmaebook this recioe, first it is just so good and second a good use of apples. 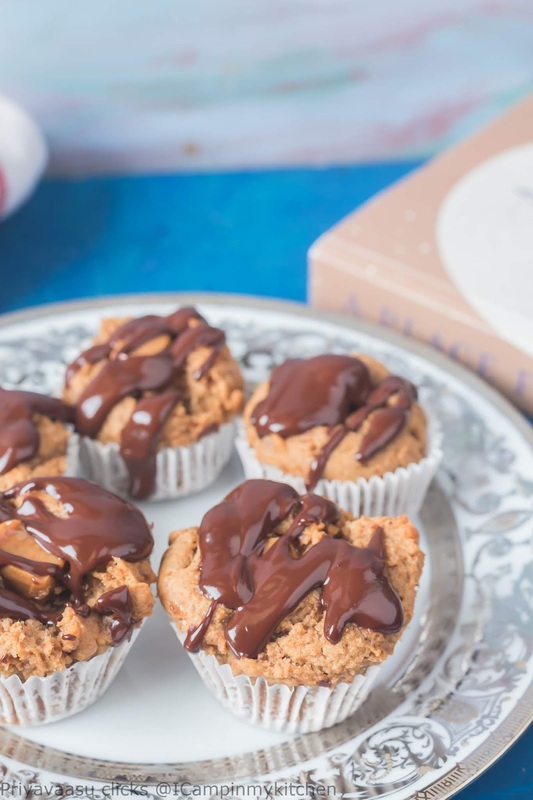 Apple jam, caramel candy and drizzle of chocolate sauce together should have made these muffins very inviting. wow - what a great use of apple jam - muffins looks fabulous! Amazing muffins. I want some Priya love the use of apple jam n caramel. some of my comments dont seem to have come thru.. I defintiely commented on this the day it was posted !! I totally fell for that chocolate drizzle and the caramel candy! I would love to take a bite! 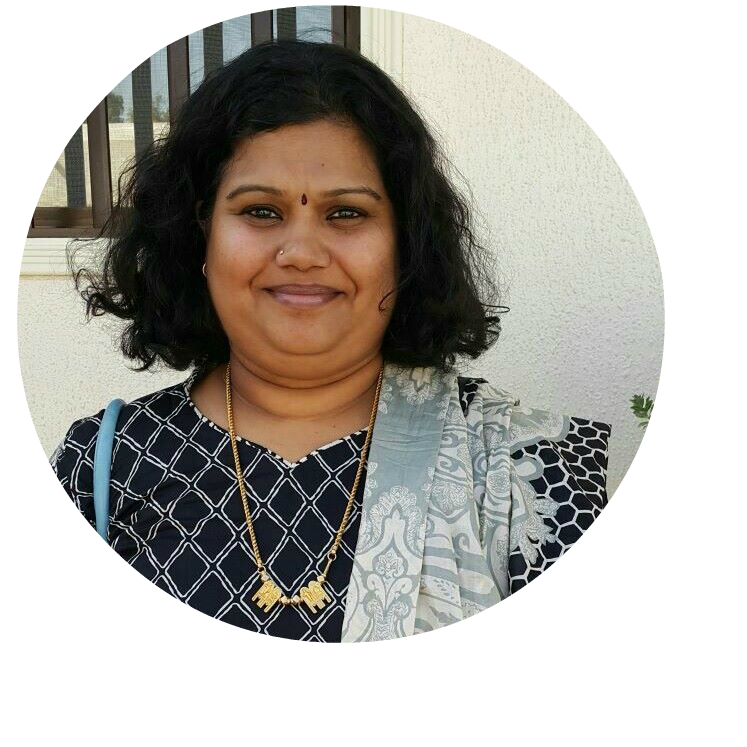 Superb cake Priya!